Last week, we welcomed all of our new teammates to the club! And, with the help of Christian, Rachel and Kevin, we reviewed some of our first lessons. Christian told us about peace. As martial artists, we must never use what we learn in class for violence. We always need to find a peaceful way out of conflict - just like Jesus when he was arrested. Kevin told us about the importance of having a firm foundation in kung-fu and in our life. In kung-fu, our stance is our firm foundation and it gives us strength and stability and ensures we do not get pushed over. Jesus and his teachings give us a firm foundation in our lives and with him and his teachings, we will always have strength and stability in our life. We also reviewed that a good martial artist demonstrates love, joy, peace, patience, kindness, goodness, faithfulness, gentleness, and self-control. These are also the fruit of the Spirit which grow within us as we grow our relationship with Jesus and learn and practice his teachings. We learned the reason for gifts is to show someone that we care about them and to make them happy. We also learned that we can share our talents with other people and this can make them happy. We heard about the story of Aaron (the Little Drummer Boy), who was very talented at drumming, who played his drum for Jesus when he had no other gifts to bring - and in the story, Jesus smiles. Jesus likes it when we share our talents and when we do little things to show people we care for them. We also learned that God gave us the greatest gift ever -- Jesus! A special thanks to our Worship Team for sharing their musical talents with us! If you would like to hear them play again, you can catch them every Sunday at the Salvation Army at 10:30a.m. Laoshi Catherine offered us a very special lesson on generosity. The same is true of our journey in faith. And, just like we can be part of a team in kung-fu, we can also come together as a team in our faith - a church is a good example of a giant team! The Bible talks about being part of a team -- when people work as a team, they can help each other and offer each other strength. A short but cool video on how one strand of rope can be weak but two strands of rope put together are made stronger -- this is similar to how a team can be stronger than one person alone. Laoshi Deb offered a very special presentation! We also learned that as martial artists, we need to use gentle words instead of harsh words (which can lead to anger). SONG: "BLESSED ARE THE PEACEMAKERS"
We learned that our uniforms give us power! We learned that even though things don't always go as we plan, we can find joy in all circumstances. Instead of being upset or angry that he was in prison, Paul looked for what was good about the situation. Also, because Paul was joyful in his circumstances, he was an inspiration to others. Reading and studying the Bible helps us grow our relationship with Jesus. We also grow our relationship through prayer. 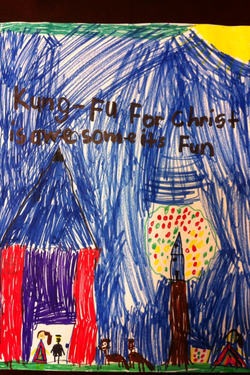 We learned about the importance of a firm foundation in kung-fu and in life. Thank-you to one of our students for suggesting this song about the wise and foolish builder!! An example of respect is found in the story of Samuel and Eli. Samuel showed great respect to his teacher, Eli. You can learn more about Samuel by reading 1 Samuel and 2 Samuel in the Bible. Martial artists do not encourage violence. They use the bow as a way of offering peace over war. Martial artists hope to solve conflict peacefully and hope never to use martial arts outside of the club. One of the fruit of the Spirit is peace. Jesus is a living example of how to be peaceful and shows us an example of peace: When a mob came to arrest him, he responded to them peacefully, encouraged the disciples to do the same, and even healed a man's ear. We should also deal with conflict peacefully by being quick to apologize, removing ourselves from the situation, and offering forgiveness. we are going to learn how to be respectful, kind, and peaceful. The Bible teaches us how to grow these qualities. Thank-you, Jeneice for your beautiful drawing! You are a creative and gifted artist and we are honoured to showcase your picture! the program? kung-fu? the Bible?